I respectfully disagree, for the simple reasons that it’s expensive and doesn’t teach you all the necessary skills. Same for custom choppers – choppers are engineered quite differently from, other bikes, including the learner bikes they use in the MSF courses. For one thing, the turning radius is drastically different. Why put unnecessary obstacles in your way when you are still learning how to manage operating the bike, riding defensively, moving through traffic, etc.? Plus, again, the cost is extraordinary compared to a basic small-cc bike, especially if you don’t know whether riding is “for you” just yet. Of course, once you are riding comfortably you can have any bike you want, and can adjust your riding skills accordingly. While it’s true that some women will be comfortable managing a bigger bike right from the start, it’s more likely they’re facing quite a bit of uncertainty or even fear. For that reason, I recommend learning to ride on a smaller bike, i.e. a Honda Rebel or Yamaha Virago (125 and 250cc, respectively), preferably used so you don’t shell out a lot of money only to find you don’t enjoy riding. A woman who might be able to readily maneuver more bike at slow speeds, or one who’s more confident going into the task of learning, might start out on a 600 Honda VLX or the Yamaha 650 V-Star. These are a little more powerful and you might keep them a few more seasons than the smaller Rebel or Virago. All of these are readily available in the used market. Once you feel comfortable riding, you’ll notice that highway speeds feel like “work” on a small (250cc) bike. At that point, you’re probably ready to move up to something a little bigger. You can easily sell the learner bike and move up to the Honda Shadows, Yamaha V-Stars, Harley Sportsters, etc. in the 650-883 range. Suzuki also makes comparable bikes in its Boulevard line – I’m not as familiar with them, but the older Suzuki 800 Intruder is also a great “move-up” bike. Eventually you may move up yet again into the largest classes, but I know many women who have ridden comfortably for years on these mid-range machines. You get used to the manual operation of the bike without feeling like you can’t maneuver it easily (such as into and out of parking spaces or through large crowds). It’s easier to pick up a smaller bike via the proper method if you drop it. And speakng of drops, it’s less heart-breaking to drop a small used learner bike (likely to happen when you’re a new rider) than it is to drop your ultimate dream bike. It’s much easier to pass the licensing test on a smaller-cc bike. You probably won’t have a financed bike to “get out from under” if you decide you don’t want to continue riding. I’ve said it often: women learn differently from men – they are more studious and often more cautious. If you want to learn to ride and want to make it as un-intimidating as possible, start small and work your way up to the larger bikes. Marketing to women who ride: bring it on! 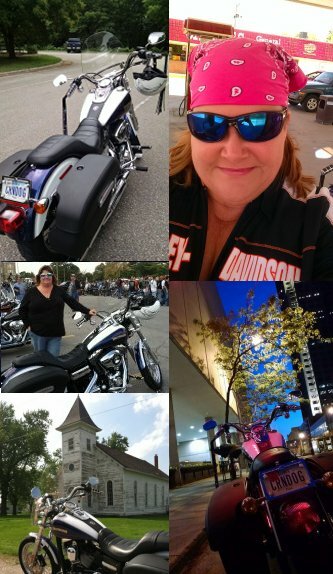 Diane over at Road Captain USA has a wonderful post rounding up a variety of thoughts on International Female Ride Day (May 1) and the designation by Harley Davidson of May as Women Riders Month. I personally don’t have a problem with HD taking the lead and proclaiming a month for women riders. For one thing, they’re only proclaiming it on behalf of themselves: it’s their opportunity to showcase women who ride HD motorcycles, offer specials on gear, host some rides, and generally promote the ideas they’ve developed around the female market. Perhaps more telling, though, is that in all their long history, groups like Motor Maids have not done this – and now I’m curious as to why. Why, if their focus all along has been women riders, did they never put the power of their nationwide chapter network behind the task of creating Women Riders Month, perhaps with an awareness or safety focus? Apparently, such a thing never occurred to them or was not important to them. That’s fine, but that doesn’t make them more deserving now of the attention or the money that may come out of it. Finally, on the notion that HD is “just trying to make money”: of course they are, and I say let them! This is still a capitalist society (at least for the moment), and they are a business hoping to stay afloat. I have long wished for companies like HD to PLEASE market to women with quality, appropriately-sized clothing, bikes built for my shorter stature, more style choices in accessories, etc. So, personally I welcome them attempting to make money off of me because I have needs and they have something to offer. While each ride we take is indeed an affirmation regardless of what the calendar or “the MoCo” says, I see nothing wrong with setting aside a day to reflect and celebrate being women who ride. (After all, we love our mothers all year-round, but we still have Mother’s Day!) And, if HD wants to pick a month to focus on me, who am I to argue? More to the point, if Motor Maids or anyone else wishes to put their own spin on Women Riders Month, or pick a different month altogether, I’m all for that too. As far as I’m concerned, HD may have named it but they’ve only taken the approach that meets their own needs. Other groups, with other needs, should step up and do likewise. This year, I’m finding it interesting that in addition to the usual articles in the media about the increase in female riders, there’s also some backlash against the women riders’ “movement” (if it can be called that). It’s not backlash against female riders, per se (though there is likely some of that too); it’s backlash against companies that are beginning to cater to women riders, host all-womens’ rides, make products for women riders, etc. And I ask myself, why would this not be a good thing? Why does Lizzie at Rippen-Kitten so vehemently oppose the new WildKaT bike, engineered by women, for women? Why is BikerNewsOnline critical of International Female Ride Day? The answer is, I think, that these folks reject the idea of being seen as a woman rider. They instead favor being seen as merely a rider. Women seek community. In all facets of life, women seek out those who share a common bond, so we can gather support, share experiences, and learn from each other. An all-women’s ride feels like more of a community, which is a key reason I started riding. Women don’t always want to be wife and mom. Yes, we cherish those roles. But on a women’s ride, we can leave those roles behind for a time and just enjoy each others’ company – as women, as adults, as independent spirits. Good God, why would we NOT celebrate that? Hey, I truly believe, “to each her own.” If you don’t like the idea of a bike built by women that takes our unique engineering challenges into account, then vote with your wallet and don’t buy one. 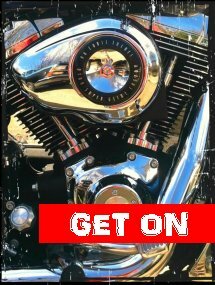 If you don’t like the idea of a women’s informational motorcycle event, or of an all-women’s ride, then please don’t participate. And feel free to express your opinion – I will be reading, voraciously, in my quest to understand more points of view than just my own. But hear this: there ARE some things about being a woman that make me a different rider than my male counterparts, and I choose to celebrate them and to applaud those who try to encourage my celebration.